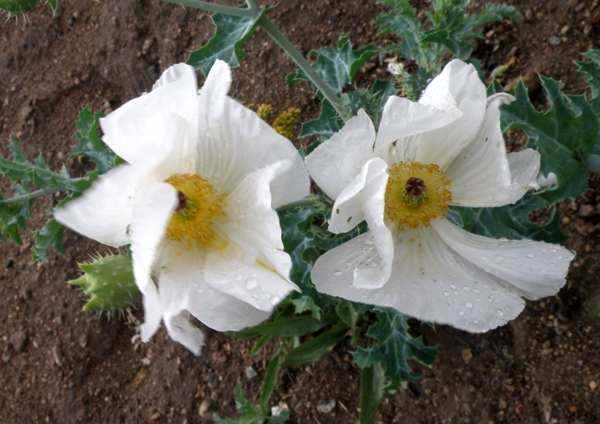 The sight of these stunning white poppies is enough to cause traffic accidents when you spot them on the side of the road - or a swift U-turn at least! Its pretty apperance belies less friendly aspects of this wildflower: all parts of the plant are poisonous to both animals and humans, and beware if you try to pick a nice bunch to take home because the yellow spines on the leaves are very sharp indeed. When not in flower it is easy to confuse this plant with a thistle because the leaves are so similiar, but there is no mistaking it for a poppy once the flowers open. 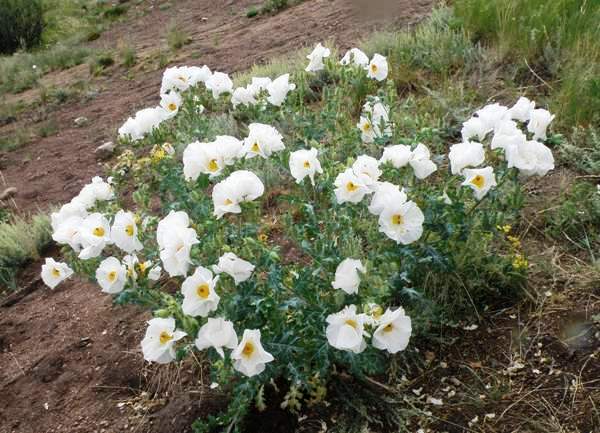 Prickly Poppy grows on roadsides, on slopes and on open hillsides and can be found in the foothills of the Rocky Mountains in North America, where it flowers from June to August. The specimens on this page were photographed in Rocky Mountain National Park in August.